Industrial agriculture is one of the biggest contributors of carbon emissions. The Intergovernmental Panel on Climate Change estimates that agriculture and associated land use changes are responsible for 24% of global greenhouse gas (GHG) emissions – greater than emissions from industry and greater than the combined emissions of transportations and buildings. Reducing the amount of meat that is served is one of the most powerful measures foodservice departments can take to reduce climate impact. Livestock production contributes 18% of the world’s GHG emissions. Eliminating meat for one day per week, for example, could reduce emissions by an estimated 1.0 gigatons (Gt) to 1.3 Gt. per year, the equivalent to taking 273 million cars off the road. When choosing better options to replace these animal proteins it is important to refer to the growing body of research outlining the health and environmental impacts of available replacements. 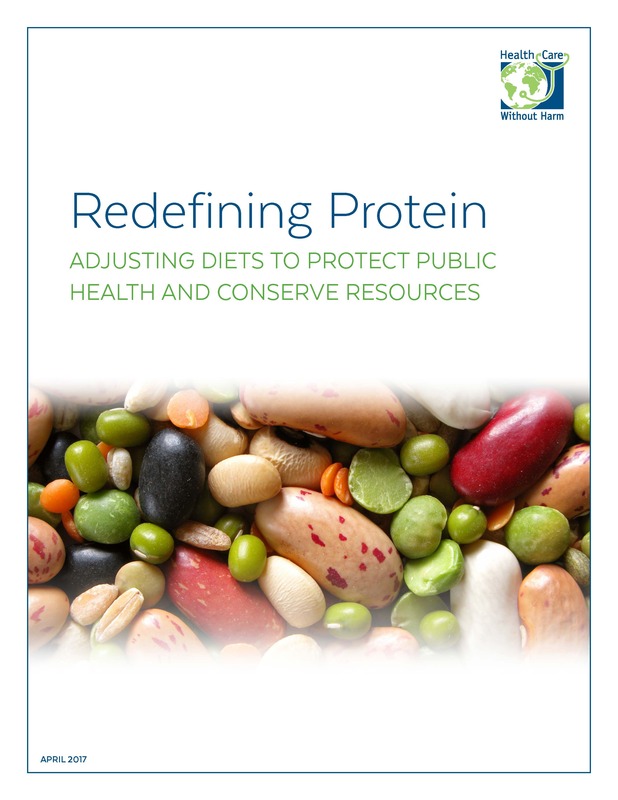 Our report Redefining Protein: Adjusting Diets to Protect Public Health and Conserve Resources and the associated Purchasing Considerations offers a pathway for healthcare institutions and others in the foodservice sector to distill current research into values-driven purchasing and menu development that will optimize health, environmental, social justice, and animal welfare outcomes. Preventing food waste and diverting unused food from landfills is another powerful way to reduce climate impact. Globally, about 30% of food is wasted. When food is discarded, the waste embodies all the associated emissions from its production, and when decomposing in landfills, generates significant quantities of methane. Halving global wasted food by 2050 could reduce emissions by an estimated 4.5 Gt. Health care facilities can reduce their climate impact by purchasing regionally and sustainably grown and produced foods. Preferential purchasing of organic and sustainably produced products results in additional GHG savings by reducing or eliminating the use of synthetic fertilizers. The manufacture and use of nitrogen fertilizers is the second highest source of GHG from food production. Nitrous oxide (N2O), the resulting emission, is a GHG with 300 times the warming potential of CO2. Agriculture is responsible for 60% of global N2O emissions. Additionally, selecting foods which rely on lower resource inputs (water, energy, etc.) and result in a lower ecological footprint overall can take a purchaser's impact to the next level. As demonstrated in the Redefining Protein report and purchasing guidelines, due to relative efficiencies in producing calories compared to animal products; grains, legumes, and root vegetables have the lowest GHG footprints per serving and per kilogram of protein compared to eggs, dairy, poultry, and pork; while beef and lamb have the highest profiles, across production systems. Prevent food waste and divert unused food from landfills at your facility. Hospitals Reduce Greenhouse Gas Emissions by Taking a “Less Meat, Better Meat” Approach to Foodservice, a pilot evaluation of implementation in four San Francisco Bay Area hospitals by HCWH and the Johns Hopkins Center for a Livable Future. The Global Change Health Assessment from the United States Global Change Research Program, an insightful examination of the health effects of climate change, and in particular food safety and availability. Commentary: Food for Thought - Hospitals Must do More to End Their Wasteful Ways Op-ed published in Modern Healthcare by the director of the Healthier Hospitals program at Practice Greenhealth offers tips for reducing hospital food waste and mitigating hunger.